You don’t need that candy. Or else it would’ve already made it into your cart. But it’s only an extra 89 cents on top of your $200 bill. Plus, you’re going to open that candy as soon as you leave the store and it’s going to make you happy. 89 cents well spent. This week you’ll take a look inside your customer’s head and figure out why they would want to buy your product or service. By understanding how your customers make decisions you’ll be able to more effectively tailor your marketing strategy. The first step of the consumer decision making process is the stimulus. These are cues that instigate an action in a consumer. They can be external with commercial or social cues. Or they can be internal with physical cues. There are three types of stimuli. Commercial – signs or advertising that a consumer sees an initiates a response. For example, the Toyota Prius commercials are visually appealing, stimulating and fun to watch. This initiates a positive stimulus in the minds of their target market. This experience makes consumers think about their transportation issues. Social – when someone is induced to make a purchase because of peer pressure. For example, 10 year-old girls don’t need cell phones. But since all their friends have them, they think they need them too. Physical – this represents a personal, physical response to a need. For example, I was hungry before watching the Bronco game this weekend. This stimulated a desire to eat food. The next step is problem recognition. This is when the consumer realizes they need to do something to get back to a normal or higher state of comfort. This is a result of one of two things: shortages (needs) or unfulfilled desires (wants). Shortages – a functional response because the consumer needs something they don’t have. This could also be a need for something that the consumer had never considered. For example, 50 years ago we didn’t know we needed cell phones. Now it’s becoming necessary if we want to communicate with the rest of society. If you don’t have a cell phone, then you have a cell phone shortage. Unfulfilled desires – a psychological response because the consumer wants something they don’t have. For example, you might have a sufficient mode of transportation. But you have some extra cash and you want to upgrade to a newer vehicle, you might buy a new car to satisfy this unfulfilled desire. After recognizing that something needs to happen to get back to a normal or higher state of comfort, the consumer begins searching for information. These searches exist either internally (from what they already know) or externally (from other sources of information). Unfortunately, businesses can’t directly control the internal searches but they have considerable control over the external sources of information. Knowing where consumers search for external information is important so you know where to put your information. If you know that your target market searches online, then you need a website. The more risk associated with the purchase, the more information consumers typically collect in hopes of reducing their perceived risk. As a marketer, there are five types of risk that you need to alleviate. Economic – The risk that they’ll make a poor financial decision on their purchase. For example, if Verizon is selling a $200 phone, then they have to put enough information out there to convince consumers that the phone is worth as much or more than $200. Social – What will others think about this purchase? For example, it would be socially risky for a burly man to purchase a Toyota Sienna minivan. Psychological – What will this purchase do to the individual buyer’s self-esteem? For example, consumers feel uncomfortable signing long contracts. So Verizon has to offer enough information to lower this psychological risk before consumers will agree to purchase a calling plan. Physical – The risk that their purchase will physically harm them. For example, health-conscious consumers feel more comfortable eating Subway because Subway has done such a good job marketing the health benefits of their sandwiches. Typically fast food is viewed as unhealthy, and this is a physical risk. Performance – Will the product or service do what it’s supposed to do? For example, if a consumer is going to spend $65K on a Land Cruiser, then they have to know that every function of that product is going to work properly. Once the consumer is satisfied with the amount of information they have found, they begin to evaluate their alternatives. As an entrepreneur, you have competition. This is the point where your target market stacks you up against the competition to see who comes out on top. Think about this as a process, not an event. More often than not, the alternative evaluation is quickly carried out within the consumer’s head. This means that it’s your job to get in the consumer’s mind as part of their consideration set. 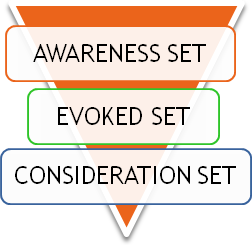 To get into their consideration set, they have to be aware of your company and they must be able to think of your company. Once they are able to think of your company, you must be in their top three or four alternatives for them to consider purchasing from your business. For instance, you are aware of lots of different restaurants. If you need to go to lunch, think of all of your alternatives. These alternatives are your evoked set. Then your top three or four choices are your consideration set. If you’re a restaurant owner, you want your business to be considered in the top three or four restaurants that your target market considers. If you find that your product or service isn’t included in the first couple alternatives, then you need to do three things to get in their consideration set. Inform them about your product – If consumers have never heard of your company before, then your marketing needs to focus on relaying the benefits of your product. They can’t consider you if they don’t know about you. For example, let’s say Subway is opening their first shop in a foreign country that has never heard of their company. Subway must first inform the consumers that they offer delicious sandwiches that are made fresh. Change their performance beliefs – Consumers aren’t going to consider you in the alternative evaluation if they believe your product is inferior to a competing alternative. If this is the case, you need to change what they believe to be true about your product. For example, if the Toyota Tacoma is viewed as inferior to the Ford Ranger, then Toyota has to alter this negative viewpoint. To counteract this belief, Toyota might run a series of adds that compares the Tacoma to the Ranger on various aspects of performance. Change their importance weights – If you offer a product that is superior in one aspect that consumers don’t currently value, then they’re not going to recognize that benefit. For example, Verizon offers unsurpassed 3G coverage. But if their potential customers don’t value being able to access the Internet, then it won’t matter. Verizon would have to encourage consumers to place more value on quickly navigating the Internet. Store – Various types of retailers. For example, if a consumer wants to purchase a new car, they’ll likely go to a dealership. Nonstore – Typically over the Internet or through a catalog. For example, if a consumer wants to purchase a new phone, they might order one from Verizon.com or another online retailer. Finally, the consumer has recognized they needed your product, put your product up against the competition and purchased your product. Now it’s time for them to evaluate their purchase. One thing to consider is cognitive dissonance, also known as buyer’s remorse. As an entrepreneur it’s your job to make sure this doesn’t happen. To do this you need to make sure you the consumer’s perceptions are better than or equal to their expectations. Following a satisfactory or unsatisfactory experience, consumers have three possible responses. Exit – When a consumer buys a product one time and leaves. For example, when a consumer buys a sandwich, they likely don’t develop an opinion on that sandwich either way. Unless it was really bad or really good. Thus, they’ll buy, eat, and not think about it ever again. Voice – When a consumer talks about their satisfactory or unsatisfactory experience to other consumers. For example, if a Prius breaks down on the ride home after the purchase, that consumer is going to tell a lot of people about it. On the other hand, when that consumer fills up for $20, they’re going to mention that too. Loyalty – When a consumer decides to become a recurring customer because they were very satisfied. For example, if the father of a teenage daughter has a Verizon phone that he loves, he’ll probably put his daughter on a Verizon phone as well. If you got here without being subscribed to “Entrepreneur’s First Marketing Plan”, you’re missing out! This is the fourth week in a 10-week series that will walk you through developing a comprehensive marketing strategy for your start-up business. If you’re not already a subscriber, click here to learn more about the free course.